Offering a great range of accommodation options just 200 metres from beautiful Mermaid Beach, A' Montego Mermaid Beach Motel features a convenient range of onsite facilities within minutes of local shopping, dining, entertainment, activities and attractions. The motel is just 10 minutes from Surfers Paradise and is close to Robina and Carrara’s Metricon Stadium. The motel is also just 20 minutes from Seaworld and 30 minutes from Movieworld and Wet’n’Wild. 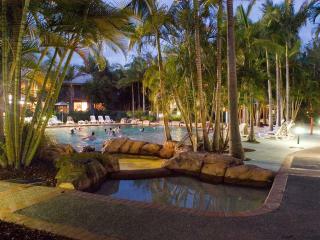 Diamond Sands Resort is a low rise property set in lush tropical landscaped gardens right in the heart of Mermaid Beach, between Broadbeach and Burleigh. Located on the Gold Coast Highway, this affordable holiday resort features a great choice of 1, 2 and 3 bedroom self contained apartments and a fantastic range of family friendly facilities including a huge lagoon style swimming pool. The resort is also just a short stroll from the safe surf patrolled beach at Mermaid, plenty of shops, restaurants, bars and casino at The Star Gold Coast. Ideally located in the heart of the Gold Coast, Mermaid Beach Park View offers spacious, self-catering apartment accommodation in a boutique complex surrounded by immaculately manicured grounds. Just metres from the beautiful, life guard patrolled Mermaid Beach, Park View enjoys a great range of onsite facilities within minutes of popular local shopping, dining, activities and attractions including the Casino, the Gold Coast Convention Centre and Pacific Fair Shopping Centre. Located on the beachfront between Burleigh Heads and Surfers Paradise, Spindrift on the Beach offers apartment accommodation just a short stroll from both Mermaid Beach and Nobby’s Beach. Surrounded by shopping, dining, activities and attractions, the resort enjoys a great range of onsite facilities and is conveniently close to popular attractions but far enough away from the crowds to be a relaxed and peaceful holiday. Just a few doors down from the Nobby’s Beach Surf Club, the resort is also just minutes from the Gold Coast Convention Centre and Gold Coast Airport in Coolangatta. Situated within minutes of the white sands of Mermaid Beach, Turtle Beach Resort offers a family-friendly range of apartment accommodation surrounded by lush, tropical gardens. Close to a variety of local shopping, dining, entertainment, activities and attractions, the resort is home to an amazing range of onsite facilities including a lagoon pool, kids pool and water slide, mini golf course, tennis courts, kids club, day spa, cinema theatrette and much more.